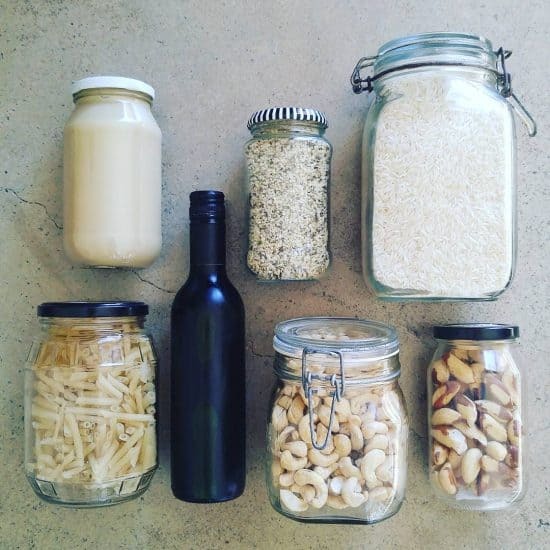 Glass jars are almost the symbol of the zero waste movement, and for good reason. Glass jars are super useful, readily available and extremely versatile. If you’ve been slinging your empty jam jars in the recycling, think again! 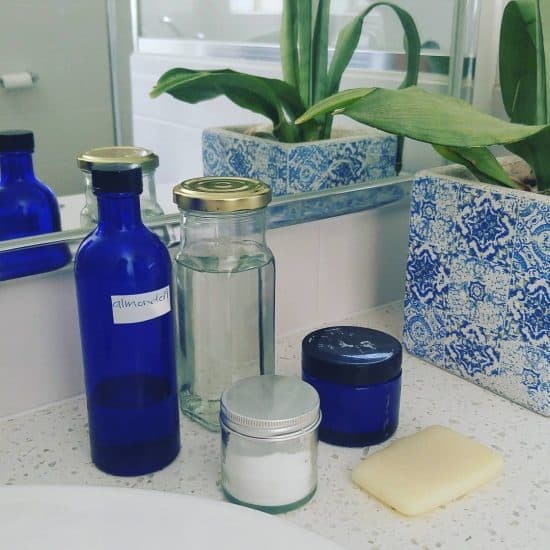 There are plenty of ways that you can use glass jars, and plenty of places you can pass them on to others who will use them. No glass jar deserves to be single-use. 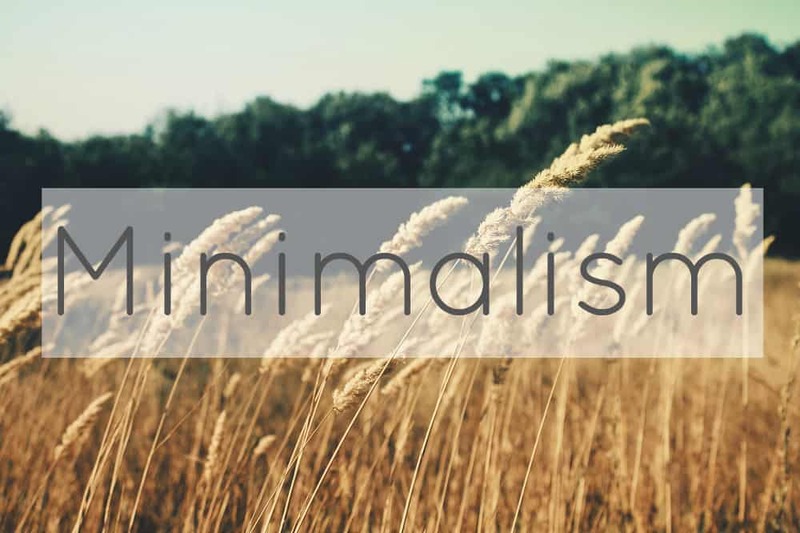 This is the zero waste life, after all! If you have access to a bulk store (where you can put food directly in your own containers to avoid packaging), glass jars are perfect. Ensure the weight of the jar is recorded (you may be able to do it yourself, or you may need to ask a staff member to do it for you) so you don’t end up paying for it! Shopping this way makes it very easy to unpack straight into the pantry. 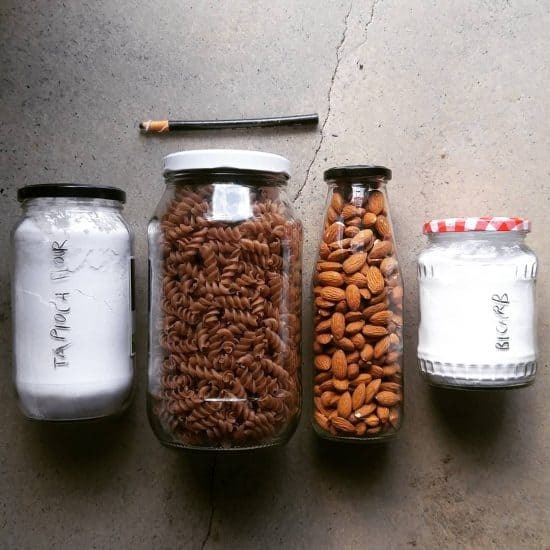 Jars can be used for storing food – taking lunch to work, keeping your pantry organized, holding snacks, storing leftovers in the fridge, and storing food in the freezer. Wide-neck jars are more suitable for freezing – ensure the contents are chilled before freezing, don’t overfill the jar (frozen food will expand) and loosen the lid until fully frozen, to allow for expansion. Jars can be used on the go for takeaway smoothies or coffee. If you want to protect fingers from scalding, make a heat band using elastic bands or charity silicone wristbands, or use fabric. 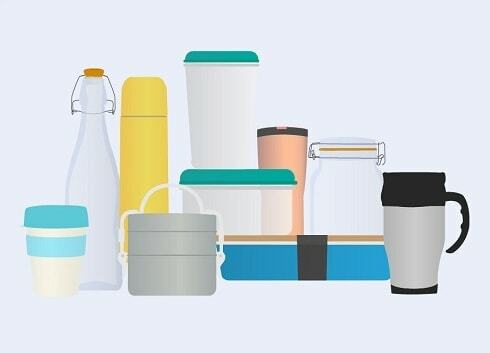 Jars can be used to store non-food items, like toothbrushes or pens, keep small recyclables like batteries or bread tags, or for freshly cut flowers/foliage. 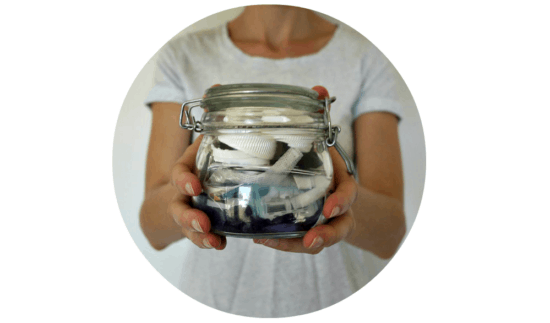 Jars can be used for keeping cleaning products such as laundry powder and personal care products like moisturiser. Some can be purchased in bulk, or you can make your own. They can be used for candle making. 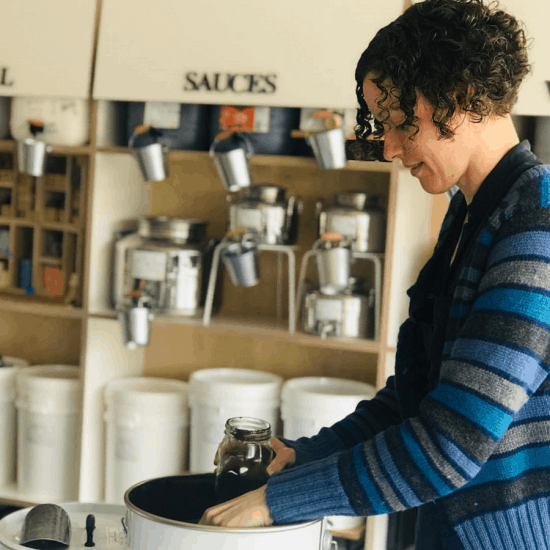 Jars can be adapted with grater insert lids, pump and dispenser arm lids and sprinkler attachment lids to make them multi-purpose and increase functionality. Jars can be used as gift packaging (store-bought or homemade treats, soap). A bit of fabric over the jar lid and they look fantastic! If you’re so inclined, you can even use a glass jar instead of a rubbish bin. Glass jars replace so many things we have around the house. They are versatile, multi-functional and available everywhere. 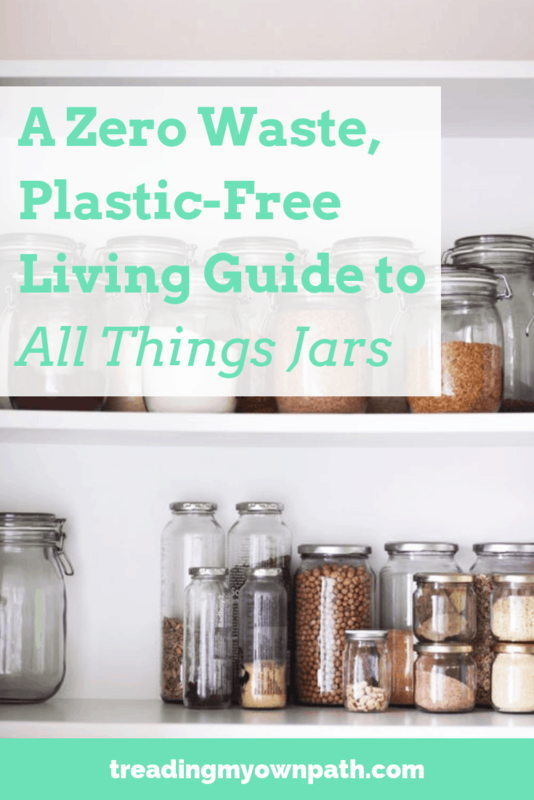 The zero waste lifestyle is the second-hand lifestyle, so the ideal would be not to buy any brand new jars. First, stop recycling your glass jars and save them for re-use. 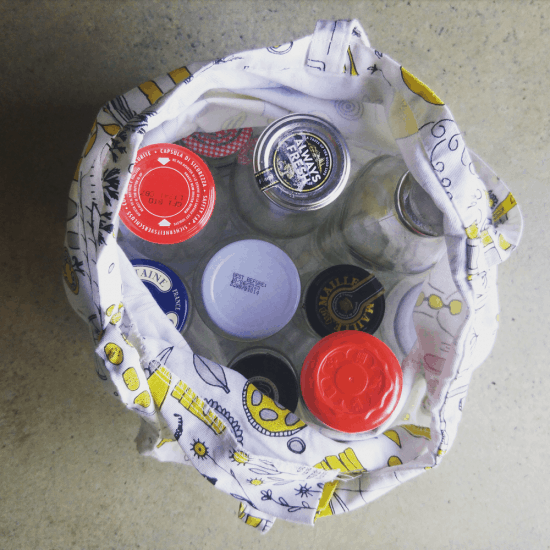 Rescue glass jars out of your friend’s (and family’s) recycling bin. Rescue jars from the office kitchen (the enormous coffee jars that are often found in workplaces are great for food storage). Rescue glass jars from restaurant and cafe recycling bins (you’ll probably need to ask first – this is where I sourced my 2 litre glass jars). 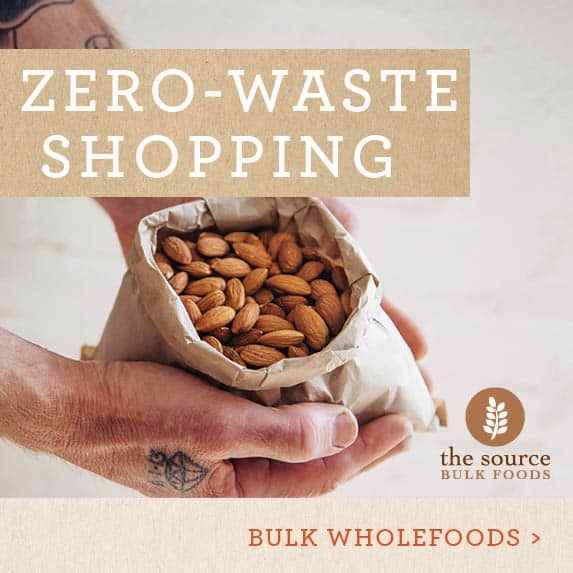 Ask on your local Buy Nothing group, or zero waste/sustainable living Facebook Group. Look at online classifieds such as Gumtree or Craigslist to see if anyone is donating or selling boxes of old glass jars. Charity shops are a great place to find vintage glass jars, and some of the more fancy/specialist jars such as those required for canning. If you really need to buy new, consider visiting a local specialist cookware or homewares shop rather than ordering online. Glass is breakable and needs to be heavily packaged to protect it – this will probably mean using plastic. Then there’s the carbon footprint associated with shipping (glass is heavy). 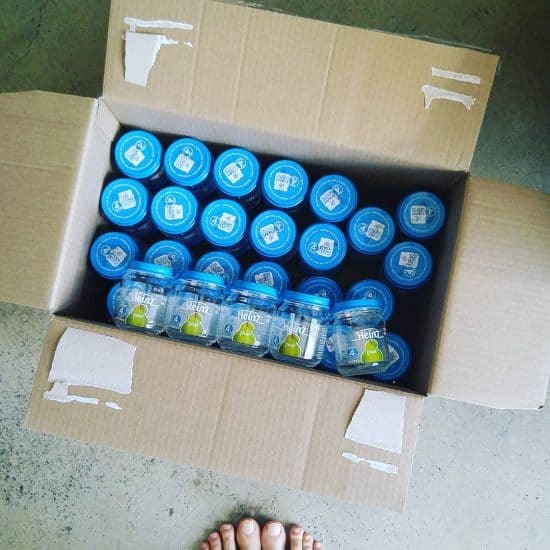 It is lower waste to buy the jars that have already been shipped to within a few kilometres/miles from your home. If you can’t bear the thought of second-hand mismatched jars and really need a set that is more pleasing on the eye, plus don’t have time to trawl through online classifieds slowly slowly building up a matching collection, no judgement. Everyone has a mess threshold and if this is what tips you over the edge, do what you need to do. 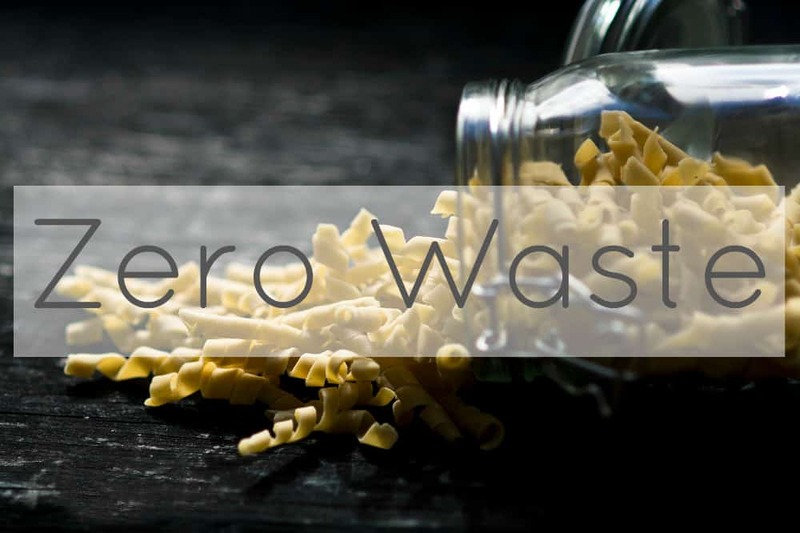 You’ll be using whichever jars you end up with forever – that’s how zero waste works, right?! The most common jar lids are those from repurposed jars: made of steel with a plastic lining inside to slow down the metal rusting/corroding. The threads wear over time, so older lids will not give airtight storage. 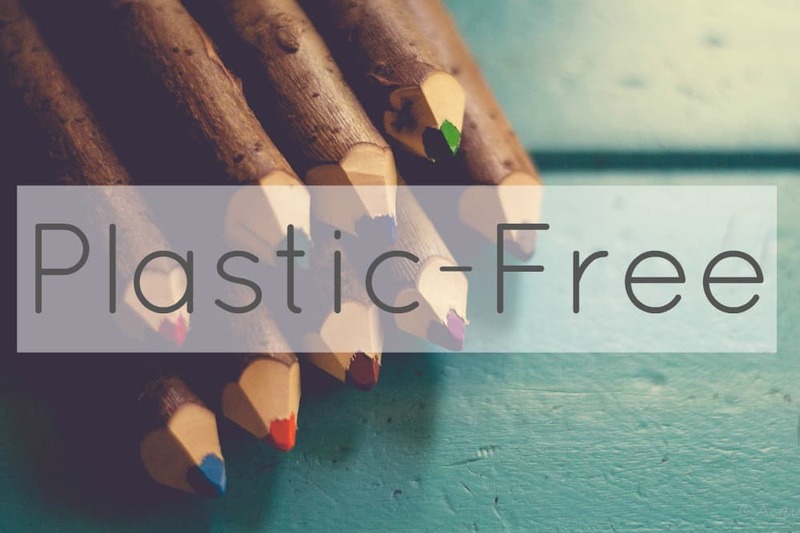 Whilst not plastic-free, the plastic typically isn’t touching the food, and I’m happy to use these as they are readily available at fit the jars I have. Occasionally you might see aluminium lids, and these have a plastic wax disc inserted to separate metal and contents. 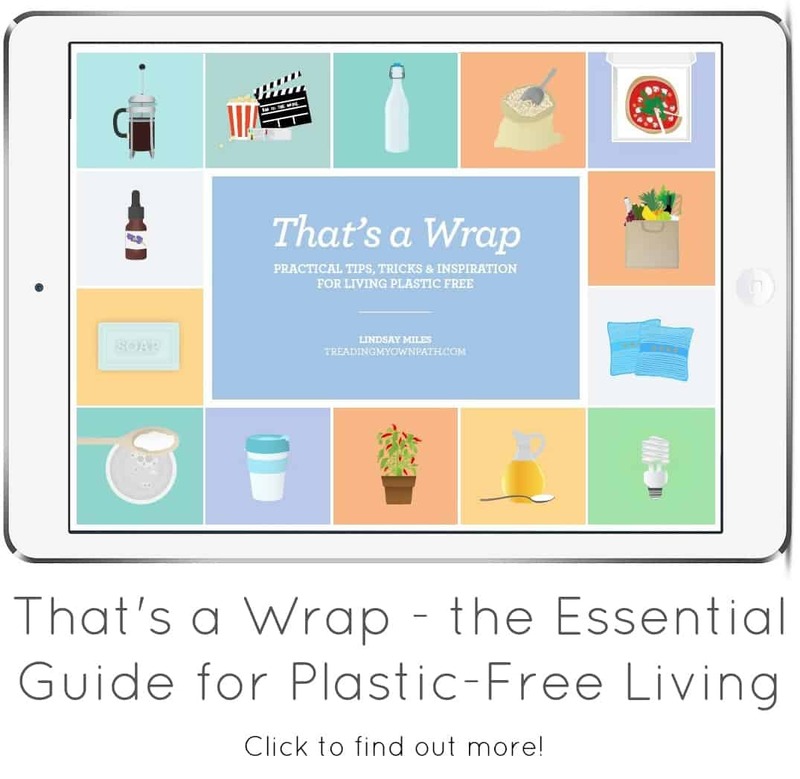 The wax disc can be easily removed to create a plastic-free jar and lid. Some jars have plastic lids. If the jar is a shape I know I’ll use, I’ll keep it, otherwise I’ll pass it on (more details on where at the end of the post). If you really want to avoid plastic, its possible to find jars with glass lids, that seal with a silicone band. The lid stays attached to the jar with a metal hinge system or with metal clips. These jars are also suitable for canning as the silicone band creates an airtight seal. Le Parfait is the classic French brand for the hinge lid jars, although many similar versions exist without the visible branding. Weck jars are German, and use the clip system. It is possible to buy wooden lids for Weck jars which seal without the clips – not suitable for canning but more suitable for pantry storage. Metal jar lids can be recycled via a metal recycler at the end of their life, and new lids can be purchased from specialist kitchenware shops or online without needing to buy a whole new glass jar to go with it. Alternatively, you can find second-hand jar lids. If you’re lucky, the label on the jar will peel straight off. If not, try soaking in water for a few minutes. For some labels this loosens the glue and then label comes straight off. If you attempt to pull off the label and it comes off, leaving a sticky, gloopy mess on the glass in its wake, my tip is to use eucalyptus essential oil. (I’ve been told lemon essential oil also works well.) Dab some onto a rag, and wipe – the glue comes off instantly. If that’s not an option because even after soaking all you’ve managed to do is fray the outer edges of the label, coconut oil will get that label off. 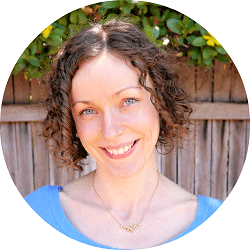 Smother the label in coconut oil, and wait. I usually do this overnight – but this time I have label rage and need a break before resuming the activity! After a few hours, the label will just slide off. Magical! Of course, you don’t have to remove the labels. But it is a lot easier to see what is in the jars, looks neater, and saves the confusion of eating “mustard” only to find out it is jam, or constantly moving the dried oats to the fridge because the label says “keep refrigerated”. Finally, on the topic of labels: if your lids are slathered with brand logos or are a rather unappealing shade of green or lurid yellow, you can paint them with blackboard or other paint. You could by replacement lids. Alternatively, you can put up with the marketing in your cupboard. Now you’ve got the old labels off, time to label with what’s actually in the jar. 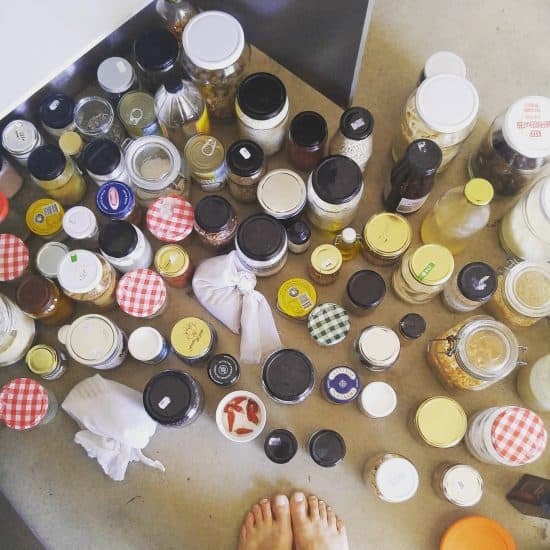 The contents of the jars I keep in my pantry swap and change all the time so I don’t want permanent lettering and labels. If you do, you could use a label maker, if you have one (it is plastic). Alternatively you could paint blackboard paint rectangles on the jars, and write on what’s inside as it changes. If you have sharpies and marker pens at home (I don’t) you can use these. I use a china pencil – a wax pencil wrapped in paper. I have a black one and a white one. Art supply stores will sell these. 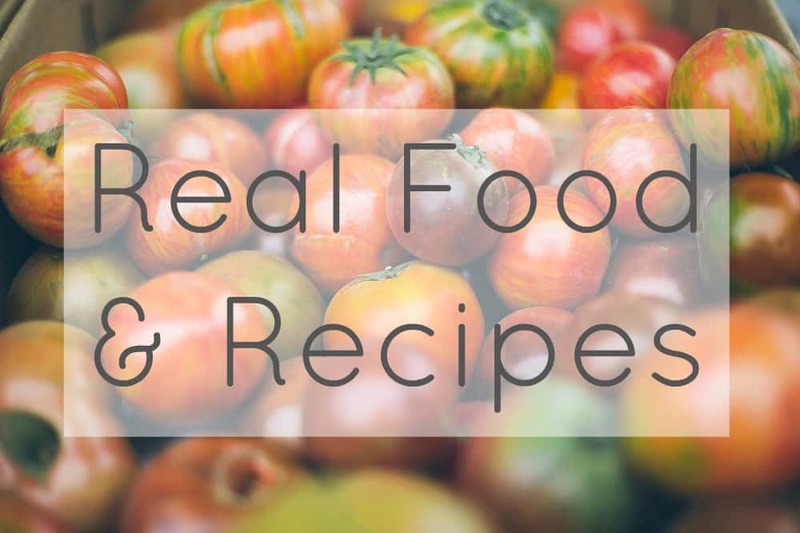 I label my jars infrequently – only when I know I can’t tell what it is without the label! I wouldn’t label pasta, for example – but bicarb? That’s a yes. Alternatively an option is to label on scrap paper or card, and tie the label to the jar with elastic bands or string. Eventually – dare I say it – we can end up with too many jars. 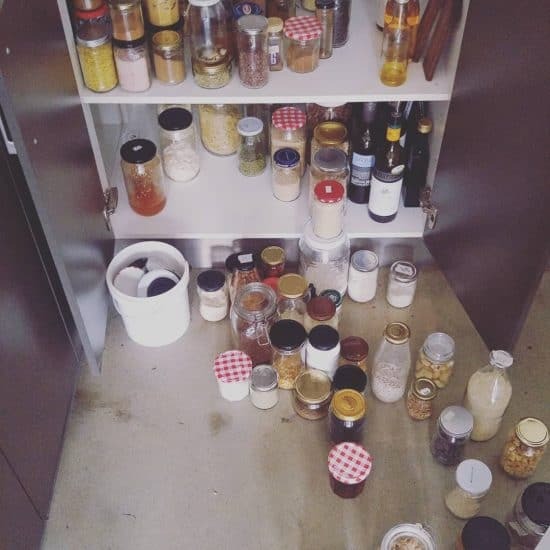 When the pantry is full of glass jars, the bathroom cupboard is also full of glass jars, the cupboard under the sink is overflowing with glass jars, and there are two surplus boxes of glass jars in the garage/shed, it is probably time to let some glass jars go. There’s really no need to hoard jars. If you suddenly realise that you need more glass jars in the future, you’ll be able to find some, for free, in a matter of hours. Probably less. Rather than let your excess gather dust, pass them on to someone who can use them straightaway. 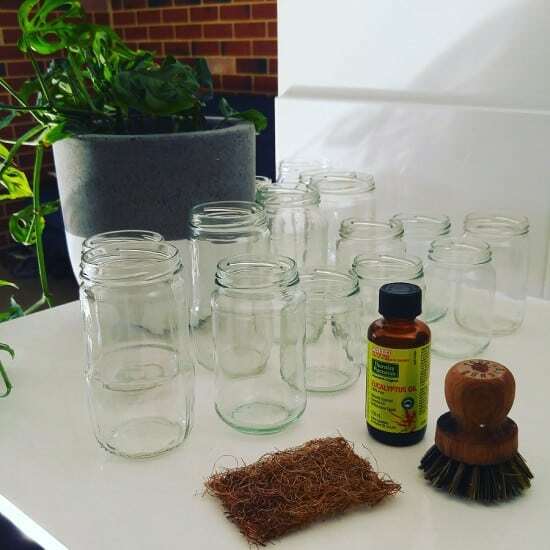 Glass jars can be gifted (and even sold) via social neighbourhood network sites, Buy Nothing groups, zero waste or sustainable living Facebook groups and online classifieds – the same places I suggested for looking for jars at the start. Some bulk stores will accept old glass jars for reuse. They pass onto customers who forget their own containers when they come to shop at the store. Charity shops might accept glass jars, but they will only want the good ones (branded is better), not the ones you fished out of recycling. 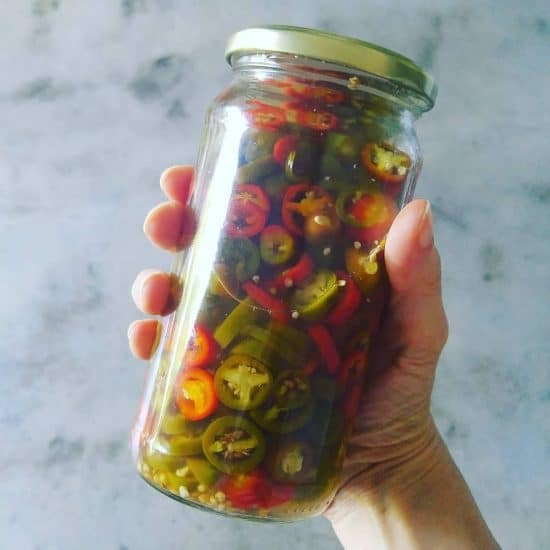 Glass jars are like the currency of zero waste. Use them where we can, pass them on when we cannot. Do not throw them away! They are a great reusable vessel, and single-use jars are surely a crime. Why would we go to the trouble of putting a glass jar in the recycling bin, only for it to be transported, ground down, melted and remolded right back into… a glass jar? 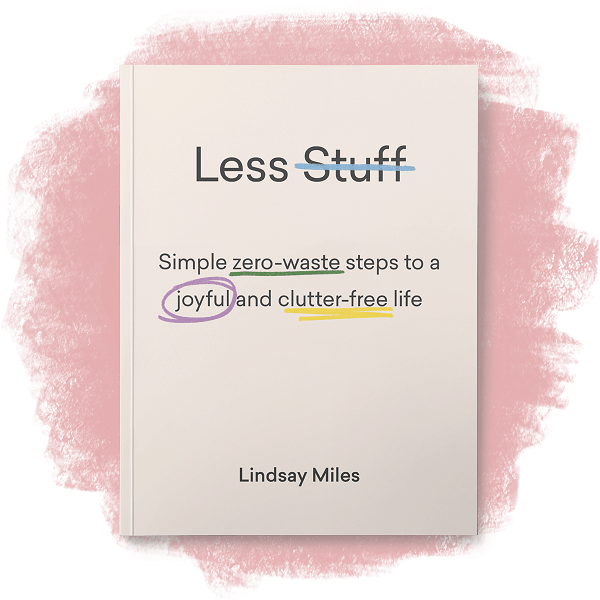 The zero waste lifestyle is the second-hand lifestyle, after all. Now I’d love to hear from you! What do you use glass jars for? What’s the most unusual use of a glass jar you’ve come across? Any tips for finding quality glass jars, or any tips for where to pass unneeded jars onto? Are you a fan of second-hand, or do you buy new? Any other thoughts? Please share your ideas in the comments below! Here in Perth wasteless pantry and weigh and pay have jar take it or leave boxes at doorway. What is the best way to get the smell and/or flavor out of a jar? Ie; salsa or taco sauce. I’ve tried boiling and letting it sit with vinegar and yet the smell remains. Whether it’s food or a hairpins, I don’t want whatever I put in next to smell like taco sauce. Put some bicarbonate soda in the jar and seal it for a few days. Add some white vinegar. It will fizz up then rinse with hot water or dishwasher. This works most of the time. I have come across some where I just can’t get rid of the smell though. I have the same problem with jars of minced garlic! You just dont want to give your homemade jam as a gift in a jar that once had garlic in it! I printed my own labels on sticker sheets I had at home. I hear you, Melanie! I do always give my jar lids a quick sniff before putting onto sweet things! Just to be sure! When my kids get stickers at school etc. I put them on the jar lids. We started using Moccona coffee jars, about 5 years ago, for dry pantry goods like oats, nuts, seeds and flour etc. Love this post as it has inspired me to do even better. I have been using my medium wide neck jars to dress up potted mini succulents (over grown in my garden) as gifts, which sparked request from some work friends asking if they could buy some of the beauties of me. Mini spice glass jars I use as toothbrush holders under my sink and to hold the random bread clips when they appear. I have learned that if I need to buy a product in a jar that I will buy it in a jar that is going to best reused in our house. Hi Lou, love your ideas! Howe awesome that people want to buy your succulent jars… that is great. And yes, I totally agree with you about if buying something in a jar, make sure it is a good jar that will be reused! I love this post as well¡ In fact I hardly ever throw glass jars, because I think using them just one time doesn´t make any sense. On the contrary I think it would be interesting they are also reused by the factories, local shops and companies,… not only at homes, but at the factories which packed the products (reverse logistics). In Spain, where I live, this has not developed yet, has it done already over there? The question is how to given them back: it is not easy but I think when you are buying the same product (in a glass jar) you end up with a box full of 10, 20, 30 jars.. in a year and perhaps it is possible to return them, specially if the product comes from a local business or a business near you. I just fished out a cute mustard jar from our household recycle. Husband missed the look of indignation I gave him. Back to the sink for a good washing and then back into use.